Hi Everyone! It’s been a slow week around here project wise because we’ve just had so much family stuff going on. Between classes and sports and squeezing in quality time together, some weeks there just isn’t time for much more! And that’s ok. When we have a few busy weeks like the last few we’ve had, I try to take a breath and remind myself that the kids are only going to be small once, and no matter how little I feel like I’m getting done, I am a mother, first and foremost. And you know what? That’s a big deal. And honestly, of all the things I do, that job is the work I’m most proud of. So hats off to not getting a single thing crossed off my to do list this week. We took the kids to Sturbridge Village, had a picnic and went to dance class, ate our meals together, and unburied ourselves from the laundry pile. It was ordinary and lackluster, but at the same time, so wonderful just being fully present and together. The kids start school soon, and that’s how it should be right now anyway. Right? Anyway, I thought I’d share a project that my husband and I did together last summer. I wish I had more photos of the process, but I didn’t know that I’d be blogging about it in a year! But before we get into the transformation, a little backstory. 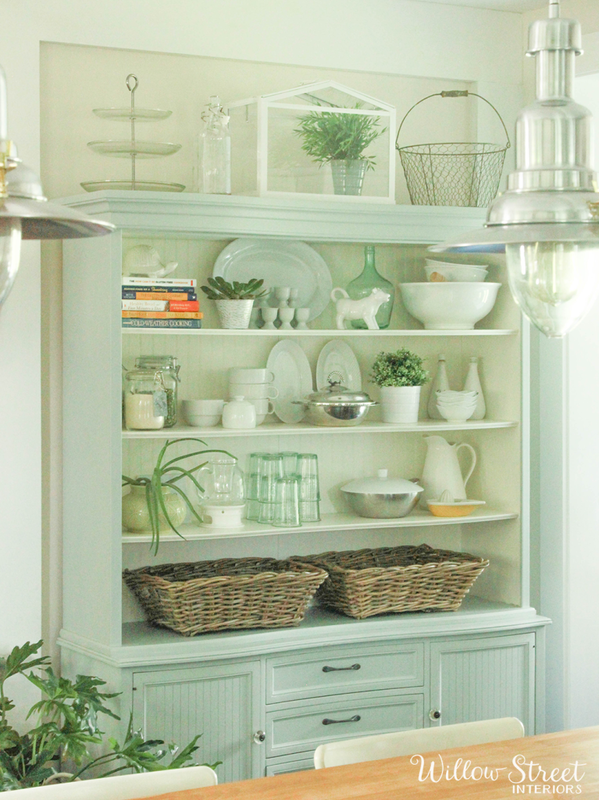 I had my eye on this gorgeous Ballard Designs hutch for my kitchen for years. 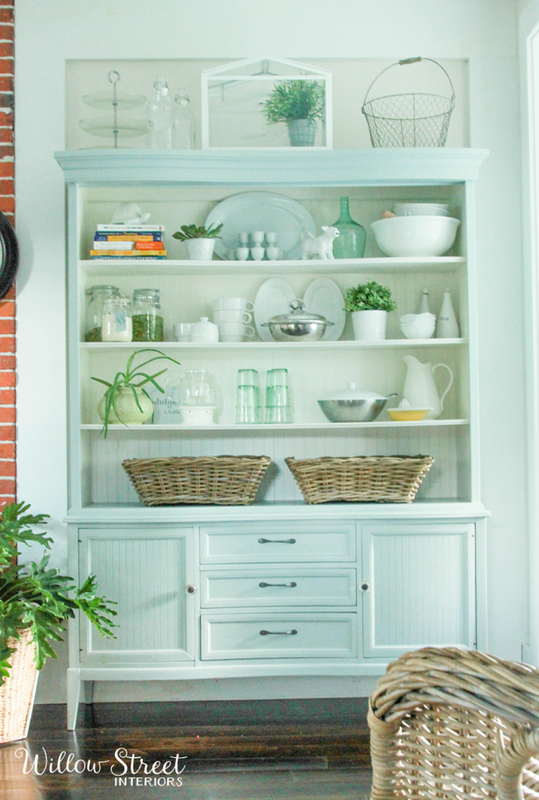 Every time the catalog came and I saw yet another room styled with this hutch in the backdrop, my heart skipped a beat. I swore I would save and save and save, surprise my husband with my huge wad of cash, and beg him to let me get this heirloom quality hutch. 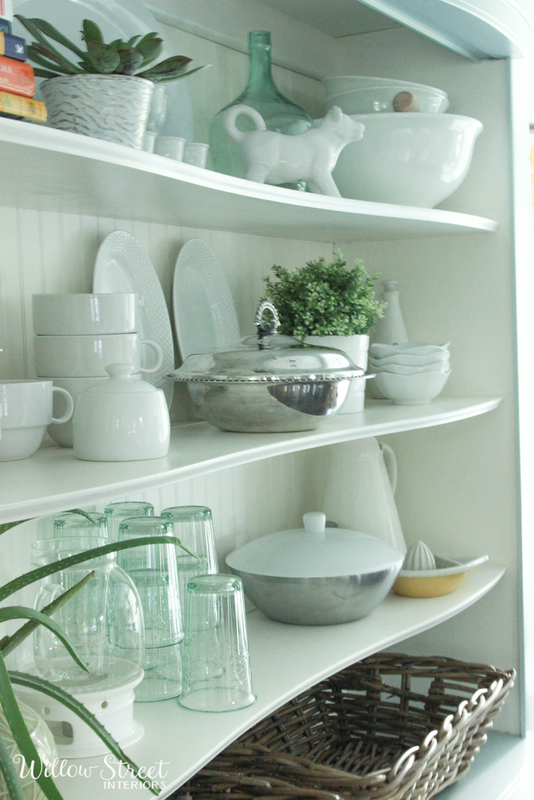 I love hutches because they lend an old fashioned sort of air to a kitchen and, I think, give a home a sense of history. Something that feels like it was passed down through the generations, and now sits serenely in a modern day kitchen. Plus, I love blending high and low pieces into the designs that I work on for clients. 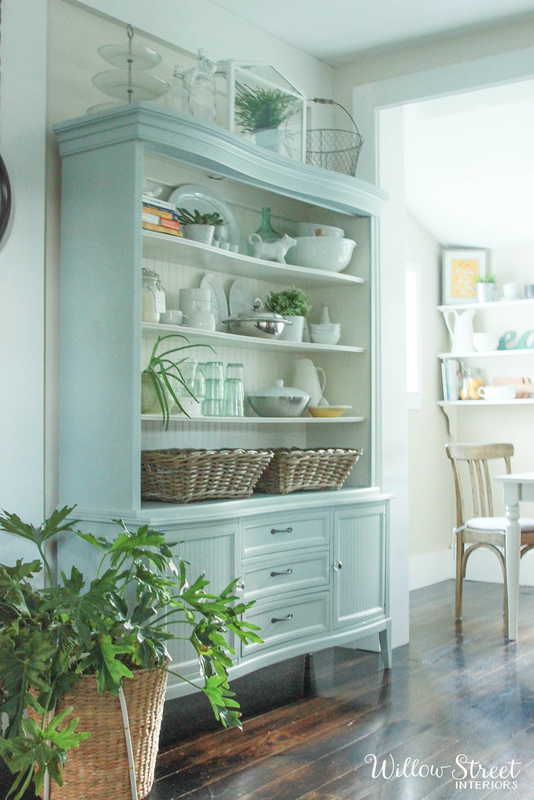 It’s a collected and gathered look, and I try to get that same style in my own home, on more of a shoestring budget. Sometimes I get lucky at Homegoods or on Craigslist, and sometimes a little elbow grease is in order. Last summer, I found a hutch for free on Craiglist. It was a beast of a thing, but had really beautiful bones. Here’s the best ‘before’ photos that I have. 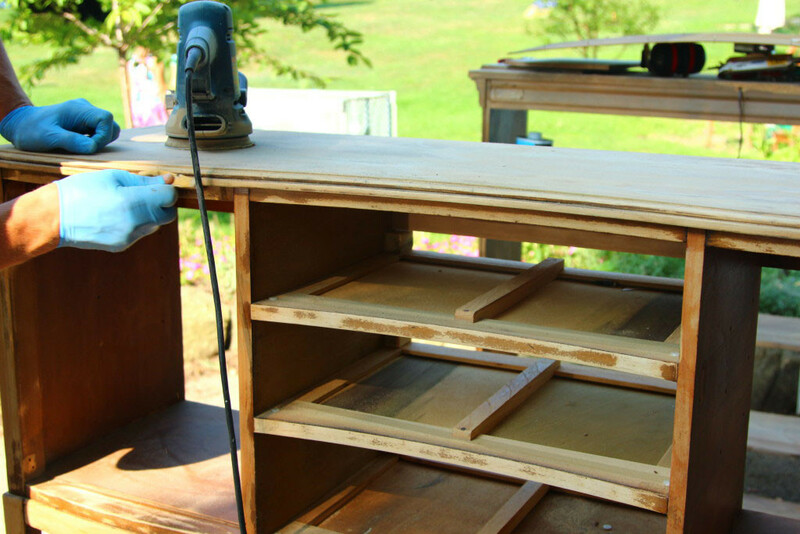 The sanding was the hardest part of the project. My hands felt like they were vibrating for ten minutes after I stopped using the sander, and I called for backup! You may notice my husband’s talented hands in this photo. When I found this little beauty one night on craigslist, I thought about my Ballard Designs hutch and finally admitted to myself that that wasn’t happening any time soon. I took out my measuring tape and the rest is history! A lot of sanding, a little painting, and some new hardware, and this ‘free’ hutch is now one of my favorite pieces in our home. And it has a really cool story to tell, since the girls, my husband, and I all had a little part in making it ours. 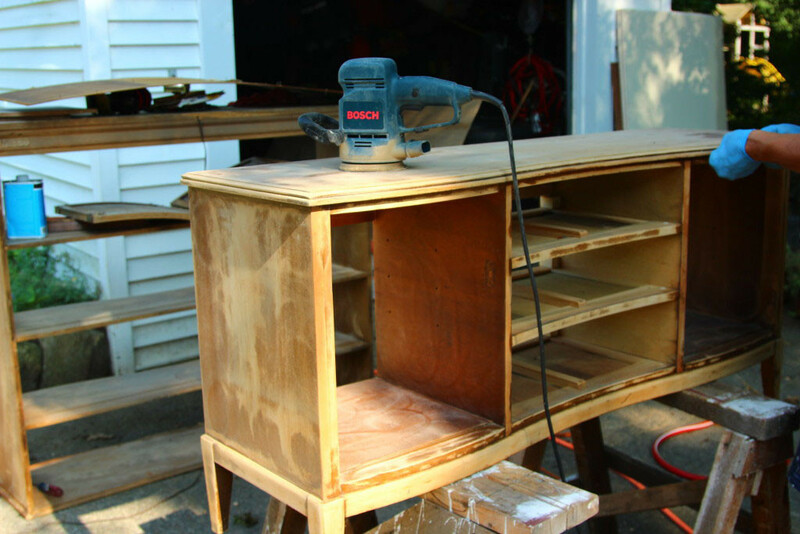 I’d love to hear about your furniture makeovers! Isn’t there something so satisfying about watching something most people would just throw away as junk be transformed into a fresh, new beautiful piece?